There is little risk of a future chief executive of Unilever abandoning the company's sustainability-driven approach, incumbent Paul Polman said. "It’s so ingrained into our business model that I don’t think any individual would take that away," Polman said on a call to journalists after Unilever announced its first-half results. "Look at the high standards the citizens of this world expect on compliance in the value chain," he said. "If you don’t look at ways to take material and cost out of the system, you won’t make it." He pointed towards innovations like a waterless toilet cleaner under the Domestos brand, and vegan ice-cream alternatives, as evidence that sustainability was woven throughout the business. It was expected that Polman would step down in the first half of 2019 after Unilever hired executive search company Egon Zehnder International to help find his replacement. But in May, he indicated he was in no rush to leave. Unilever’s underlying sales growth for the first six months of this year was 2.5% – or 2.7% excluding the spreads business, which Unilever completed the disposal of this month. But currency exchange effects meant that reported turnover was down 5% (4.8% excluding spreads). In a statement, Unilever said it had increased its absolute level of brand and marketing investment and had increased media spend while cutting costs in advertising production. At Unilever’s full-year results announcement in February, chief financial officer Graeme Pitkethly said the business had increased media spend by €250m (£223m) year on year. 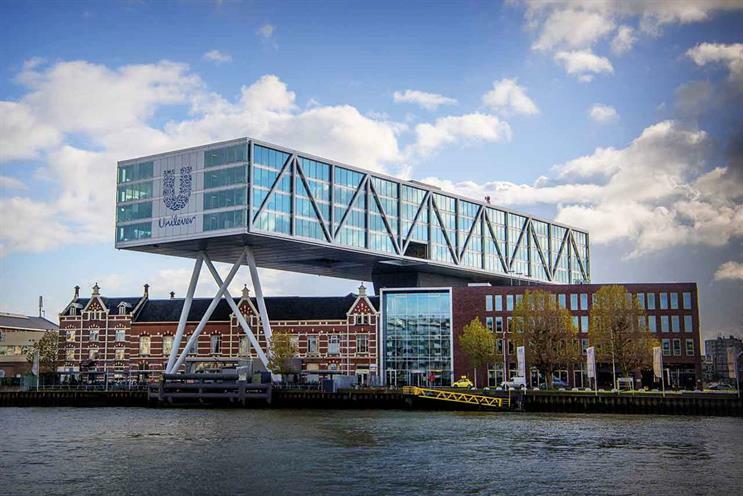 Speaking today, Pitkethly announced Unilever shareholders would vote in October on the planned new corporate structure, which will see the business abandon its joint legal structure in favour of a single headquarters in the Netherlands. While London’s Unilever House will lose its current status, it will remain the head office of two of Unilever’s three divisions: HomeCare and Beauty & Personal Care. Pitkethly said the move was "an important next step in unlocking flexibility", adding it would allow Unilever to "for the first time create true shareholder democracy" with a voting system that empowered shareholders to a greater degree. Polman refused to comment when asked about the banquet he attended last week at Blenheim Palace with Donald Trump and Theresa May.